This is probably one of the grandest of the old houses in the village which basically remains unchanged and has retained its integrity over the years. It was originally named Hamond Lodge after its builder Sir Andrew Snape Hamond who built it in 1810. The house is in the Elizabethan style and had a magnificent park which has been extensively restored by the present owner. In the garden stands an impressive Oriental Plane, one of the finest specimens in the country. Sir Andrew was captain of HMS Roebuck during the American War of Independence and he went on the to be Governor of Nova Scotia and also comptroller of the British navy. Sir Andrew and his wife are interred in the family vault below the organ at St Clement’s church and it is his coat of arms that is included in the village sign. In 1860 David Ward. a solicitor practicing in King’s Lynn, bought the house and later obtained some of the woodwork from St Margaret’s church in King’s Lynn during the Victorian restoration. This woodwork is still mounted in the hallway at Terrington Court. 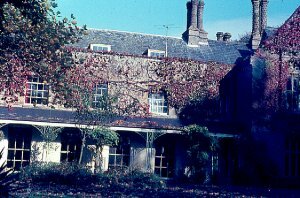 David Ward’s father William lived at Emorsgate Farm nearby and it was he who built the Parochial School for girls and infants on Sutton Road, now a private house. Hamond Lodge later belonged to the Church of England Temperance Society and for a short time was a home for inebriate women. Some of the roadside walls were topped with broken glass some of which was removed by a later owner. 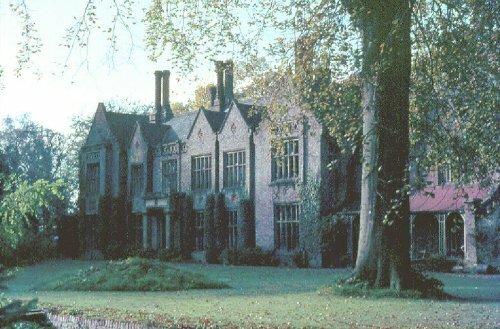 View of Terrington Court from the park. South wing, the older part of the house.